go here Well it has been another crazy week in the life of Emma! Dr. Abromowitch and Dr. Sindelar both felt it would be good for Emma to try and do a couple of weeks of intense therapy at Madonna Rehabilitation Hospital in Lincoln this summer to try and improve some of her motor skills. We had been working on trying to get something set up for almost a month now. Madonna was trying to get enough information to support an inpatient stay. Om Monday afternoon about 4:00, Madonna called and said they had an opening for a 14 day inpatient stay starting today for Emma and that our insurance had approved it. So, of course we said we would be there. Needless to say we spent most of the night Monday trying to get things arranged for Aiden and packed since we had chemo all day on Tuesday. We checked in to Madonna Wednesday at 1:00. We spent the afternoon talking with several nurses and doctors and getting settled in and orientated to the hospital. We start with evaluations bright and early Thursday morning. Emma will have occupational therapy, physical therapy and speech therapy evaluations tomorrow, Once the evaluations are done, she will have PT, OT and speech therapy a few times a day each day while we are here. Our doctors tell us this is the best place we can take her here in Nebraska, so we are hoping that this intense program will help her to make some more gains. These next two weeks will undoubtably be difficult as we try to juggle being here with Emma and still having time to be with Aiden. Thankfully our parents are more than willing to help and we have had many friends offer to help as well. I’m hoping Brent and I don’t get too stir crazy being cooped up in the hospital for two weeks. prednisone 500 20mg Thursday consisted of four hours of testing and evaluation from PT, OT, and Speech therapists asked questions and tested Emma’s ability and strength so far today. We hope that this will be extremely beneficial for her ability to complete tasks throughout her entire life. One of the doctors even mentioned that if things are headed the way they hope at the end of the two week that there is a possibility we may be staying up to four weeks. We will see. Emma had her last week of this four week phase of chemo on Tuesday. She now has two weeks off from chemo, so it will work out well to be at Madonna during her two week chemo break. Thank goodness things went better this week than last week at chemo. Dr. Abromowitch adjusted her steroids that she gets before chemo a little bit and then decided to run the carboplatin over 3 hours instead of 2 hours hoping that would help so Emma wouldn’t have a reaction this week. 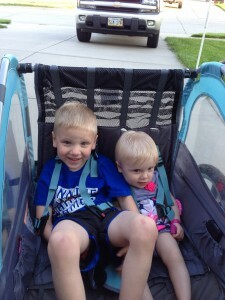 Luckily, it seemed to work this week and Emma made it through the treatment without any reactions this week. 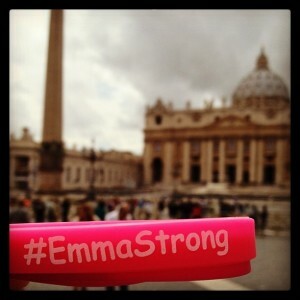 We are keeping our fingers crossed that this will continue to work so Emma can continue with this treatment regimen. It ended up taking 9 hours on Tuesday to get the treatment done, but it worked! So i guess we have some long days at infusion ahead of us. vardenafil generico 20 mg durata The stay at Madonna has thrown some kinks in plans we had the next few weeks, but we are trying to get everything sorted out. We were lucky enough to have a great weekend as a family last weekend. We enjoyed Dream Night at the Henry Doorly Zoo, which is a night where they open up the zoo and do special exhibits for kids with disabilities and illnesses. It was a great night! The normally very busy zoo, was much quieter, which was great because many of the animals were more active than they usually are. Aiden thought it was great. We got to walk back by the giraffes, and also got to tour the top of the aquarium where we got to look down over the water that surrounds the shark tunnel. We also got a ride on the train, which Aiden thoroughly enjoyed. 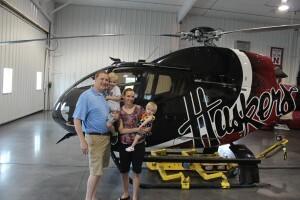 My Dad purchased a helicopter ride from Husker Helicopter in Columbus at Emma’s benefit in February so that he could take Aiden on a helicopter ride. On Sunday, we went to Columbus and Brent, Aiden, my Dad (Papa Alt), and I got to take a ride on the helicopter. 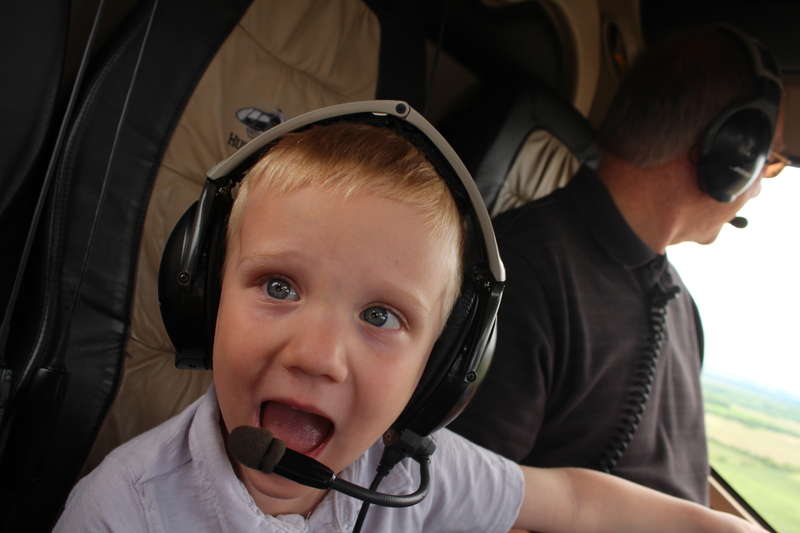 We got to enjoy a ride over Columbus and also got to fly over Brent’s family farm, which he loved. Aiden, Brent and Dad all had huge smiles on their faces! Aiden thought this was about the coolest thing ever!! He smiled and squealed the entire ride, and has talked about it all the time since we landed. 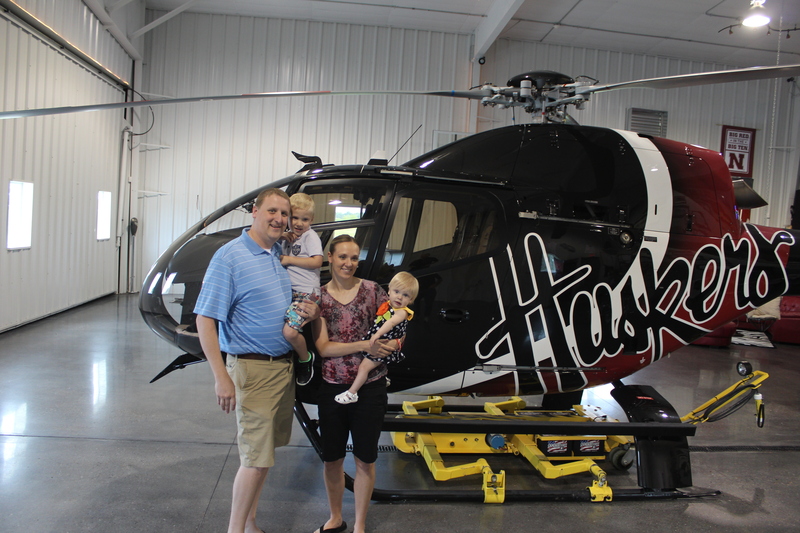 We would like to send out a special thank you to Kim and Jill Wolf at Husker Helicopter for so generously donating the ride for the benefit and for giving our family such a memorable day. It was so great to see the huge smile on Aiden’s face and know that he got to have a great day. Thank you to them for their amazing gift!